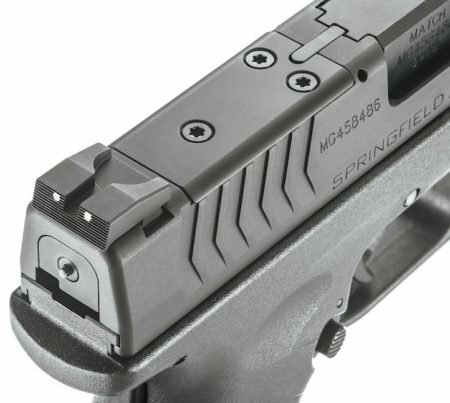 Springfield designed their XD(M)® OSP™ with a milled slide and (3) adapter plates allowing the shooter to directly attach their favorite optic. If the shooter prefers to shoot without an optic, a matching cover plate in included to provide a level slide surface similar to the non-OSP versions. 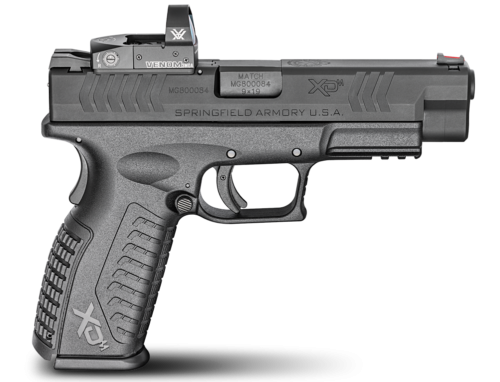 The Springfield Armory XD(M) OSP with Cover Plate. 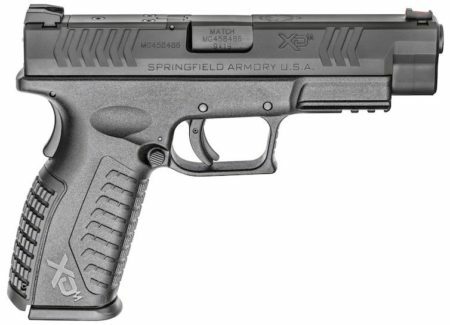 The Springfield Armory XD(M) is one of the company’s full-size pistol options, with a 4.5-inch barrel. The 5.75-inch height provides most shooters plenty of room to acquire an effortless two-handed grip. Springfield also includes (3) replaceable back-strap panels to ensure the XD(M) will fit the vast majority of shooters. These replaceable panels give shooters grip size configurations in small, medium, or large circumference. 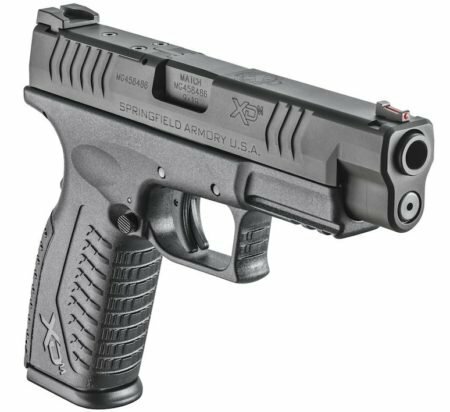 Regardless of the grip size chosen, the Springfield Armory XD(M) features one of the largest standard capacities with 19+1 rounds of 9mm. The XD(M) OSP ships with (2) 19-round stainless steel magazines, that assist with fast reloads with assured free fall drop once the magazine release is pressed. The XDM with Cover Plate attached for iron sights. If a shooter prefers to use the iron sights, attaching the cover plate, the 7.6-inch overall length will give the shooter plenty of sight radius for higher accuracy. Both front and rear sights are dovetail mounted. The standard front sight is a highly visible fiber optic sight, and the rear sights are white dot forming a more distinguishable 3-dot line-up than standard all white sights. Threaded barrel versions come with a different rear sight. 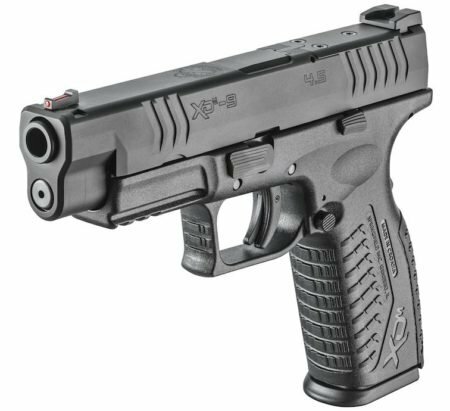 The full-size XDM offers a lot to shooters, with or without the optic. The Vortex Venom red dot optic. Springfield Armory has even gone the extra step and partnered with outstanding optic and scope manufacturer Vortex. Every XD(M) includes a pre-installed Vortex® Venom red dot optic so the user is optic-ready to head to the range and shoot. The Vortex Venom offers a three MOA red dot, balancing fast target acquisition with a dot small enough to still make precision shots. The Venom features (10) brightness levels with a top loading battery compartment. This excellent design feature allows the optic to maintain zero when a battery replacement is required, as the entire optic does not have to be removed to accomplish the exchange. If you enjoy Springfield pistols, the OSP appears to be a great option. The BlueSheepDog Crew have been very excited to see the growth of reflex optics on pistols. Pistol sights have been woefully inadequate for years. Even with advancements like fiber optic, Tritium, or other night sights, the general design of pistol sights simply do not provide sufficient sight picture in the high-stress moments that most real self-defense pistol shooting requires. Springfield’s entry into the modified optic-ready pistol market is another big push to make these pistols mainstream and not simply nice fringe options. With this addition, you can expect to see more holster and accessory companies take notice and begin a larger push to accommodate the larger sizes of these pistols. This will be very beneficial to everyone, and we applaud the move.